Hey guys! I was bored so I tried something simple to attempt and get back in the nail art swing. 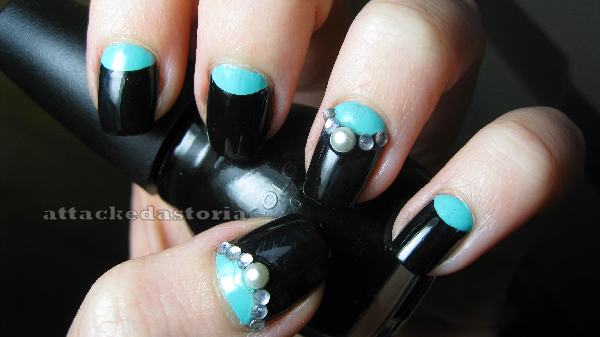 Just some half-moons with a little rhinestone/pearl accent bling. I used Nicole by OPI's My Lifesaver and Sinful Colors Black on Black. It was really easy.. I just laid down My Lifesaver, waited for it to dry, then used those hole reinforcer sticker thingies to block out the moons and laid the black over that. I'm not entirely sure if I like 'em, since I was never crazy about the half-moon trend, but I figured I might as well give a shot, y'know? Ooo I like this idea! So, so , SO pretty!